Tension springs are tightly wound coils that are designed to operate with tension. The spring stretches to a specific length as the load/force is applied to it. In an unloaded position, the loops of the spring are touching, with either a loop or hook attached at one end, and it is when this attachment is directed with force that the spring stretches. When these components are pulled apart, usually from either side, the spring tries to hold itself together, causing the springing action, until the force is stopped and it can return to its original form. They are often tightly wound in the no-load position and have hooks, eyes, or other interface geometry at the ends to attach to the components they connect. They are frequently used to provide return force to components that extend in the actuated position. 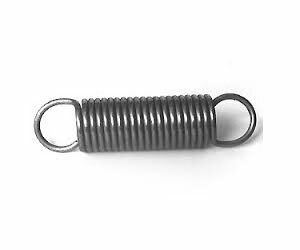 Akar Spring Works manufactures all types of Tensile as per the clients requirements. Our team of experts and quality control personnel monitor each stage of the production of compression springs, to ensure that the requirement is fullfilled.